Welcome to our series, "Ready to Go!" Book Display. Once a month, we'll highlight the latest or greatest for every age group (Adults, Teens and Children) that you can promote within your library or order for your collection. An "elementary" reference to each of Sherlock Holmes' cases as written by Sir Arthur Conan Doyle provides infographics, inspirational quotes, and at-a-glace flowcharts that explain how the Baker Street detective reached his conclusions through deductive reasoning. 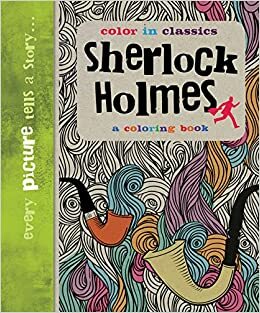 Color in 70 pages of scenes related to the classic Holmes stories. A journalist and lifelong Sherlock Holmes fan explores Doyle's original tales to reveal how they laid the groundwork for a myth of seemingly infinite variety in literary and screen adaptations. A massive collection of Sherlockian tales, presented by an Edgar Award-winning editor, features more than 80 stories about Holmes and Dr. Watson. In 1889 London young women are turning up dead, and Evaline Stoker, relative of Bram, and Mina Holmes, niece of Sherlock, are summoned to investigate the clue of the not-so-ancient Egyptian scarabs - but where does a time traveler fit in? In modern-day London, sixteen-year-old Miss James "Mori" Moriarty is looking for an escape from her recent past and spiraling home life when she takes classmate Sherlock Holmes up on his challenger to solve a murder mystery. While on summer vacation at the seaside, twelve-year-old Irene Adler meets the young Sherlock Holmes, and his friend Arsene Lupin - and when a dead body floats ashore the three young friends set out to solve the mystery. This board book introduces sound using characters, places and events from Arthur Conan Doyle's "The House of Baskervilles." Retold in graphic novel form, Sherlock Holmes attempts to retrieve a photograph being used to blackmail the King of Bohemia and finds something even more valuable. Xena and Xander Holmes discover that Sherlock Holmes was their great-great-great grandfather when they are given his unsolved casebook, from which they attempt to solve the case of a famous missing painting.